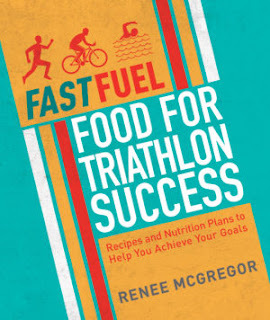 Each Fast Fuel book is tailored towards a particular sport - running or triathlon but as the requirements of each sport can be fairly similar there are a lot of similarities between each book. The contents pages of each are identical covering ‘Fuelling Basics’, ‘Training - The Road to Victory’, ‘Fine-Tuning Your Body’ and meal plans and recipes but the differences are mainly in Chapter 2 covering the training days and training intensities. Each book is plainly laid out and easy to read and understand with logical chapters and sub-headings. What do the publishers say? "No matter if you're running a 5k or a marathon, getting your training diet right is essential to maximise your performance. 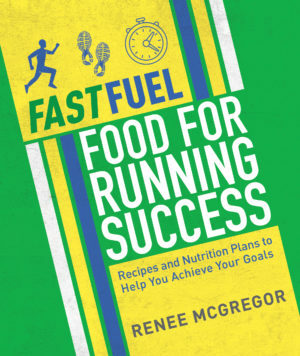 In Fast Fuel: Food for Running Success Renee McGregor, one of the UK's top sports nutritionists, explains the dietary plans required to hit your goals as a runner. The science of what to eat and why is clearly and practically laid out for whatever kind of running you do. Meal plans are tailored to your running goals and cover what to eat on rest, easy, moderate and high intensity training days. This includes how to get to grips with eating before, during and after running in the most efficient way for your body to fuel and restore itself as well as marathon meal plans and the top race day foods." "Swim, bike, run and repeat. Simple, right? Wrong. What you eat while you train is just as important as how you're training. If you're going to perform at your best on race day, acclaimed sports nutritionist Renee McGregor has the dietary plans required to hit your goals as a triathlete. What to eat, when and why are clearly explained and backed up by years of experience and expertise. Renee's eat plans and the science behind them are tailored to the multi-disciplinary training of a triathlete. She clearly lays out how to fuel yourself for success by eating right before, during and after training and advises on how to shift your plan to match the intensity of your training days." The books are easy reading which is what I want in a book about nutrition. I KNOW I have to eat better to perform better and I want to know HOW in as few words as possible. The sections are short and easy to understand and you get examples of how to calculate your carbs per kg of bodyweight, examples of nutrient dense carbs and overviews of performance enhancers and supplements such as gels, bars and real food alternatives. The books cover gluten free diet & coeliacs, vegan and vegetarian and alternative protein sources and there’s a section on body composition, racing weight and metabolism. Each section receives quite brief coverage - you get the basics, the bits you need to know and how it all fits together. This works for me as I don’t want a lot of detail - if I want to know more about a particular section I’ll research it, but in a cover-all book I want to know how it all fits together. You get meal plans for low, moderate and high intensity and recovery training which is good. Gives me an idea of what I should be eating without making me work out each macronutrient to the Nth degree and with the recipes at the end of the book there are options to swap in and out meals that don’t appeal. Fine tuning is an interesting section covering topics such as ‘Troubleshooting’ and ‘Common Complaints’, ‘Injury Prevention’, ‘Nutrition for Injury’ and ‘Lost Your Running Mojo’ - which is something that tends to hit me about this time of year. Also useful for this time of year are the following sections ‘Boosting Immune System’ and ‘Pain in the Guts’ - very relevant for me after the sheer amount of mince pies and cheese I eat at this time of year. This chapter also touches briefly on hormones and the menstrual cycle and how different types of foods can help as women use a higher percentage of fat for energy at certain cycle points. Approximately half of each book are meal suggestions and recipes. Most of these sound delicious to me (I’m a foodie, ok?) and follow a similar pattern to my usual eating - covering whole foods and being fairly low in sugars and carbs although there are variations. There are a lot of suggestions for each and suggestions range from smoothies to egg fried rice with toasted cashews to coriander lamb with quinoa and cheesecake. See - yum! What's the difference in the books? 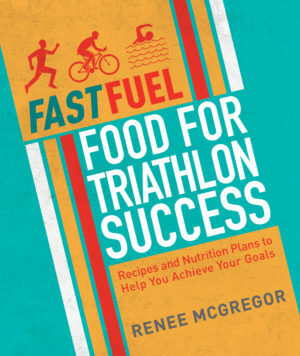 The main differences between the Fuelling for Triathlon and Fuelling for Running books are in Chapter 2 in the ‘Training to Perform’ section. This is where the books look at different training intensities and sessions. There are multiple differences (and similarities!) between triathlon and running but one of the main differences is that triathlon often requires double-days. This is where 2 different activity types might be scheduled for the same day such as a morning swim and an afternoon run. The FastFuel books take this into account in ‘Training to Perform’ chapter, but the rest of the books follow a very similar layout and include identical elements such as injury prevention, tummy troubles and lost enthusiasm as all of these can trouble athletes in both sports. Renee McGregor is a leading sports and eating disorder specialist dietitian with over 15 years experience working in nutrition and with elite athletes coaches and sports teams. She is accredited by the Health and Care Professions Council, the Sports and Exercise Nutrition Register, and is a member of the BDA’s Sports Nutrition Specialist Group. I enjoyed these books. They’re both very easy-to-read and laid out in a logical way without giving too much extraneous detail. I’d certainly recommend these if you’re interested in finding out more about how nutrition can help your performance but if you’ve already got a more advanced understanding of sports nutrition then these may be too basic for you. I’d also say you probably wouldn’t need both books as there are many similarities in them. They’d be a perfect buy for someone who is getting more serious about their chosen sport and looking at ways to become faster and more efficient by training smarter. I was sent a copy of each book to read and review but as usual I didn't accept payment and wrote exactly what I thought.